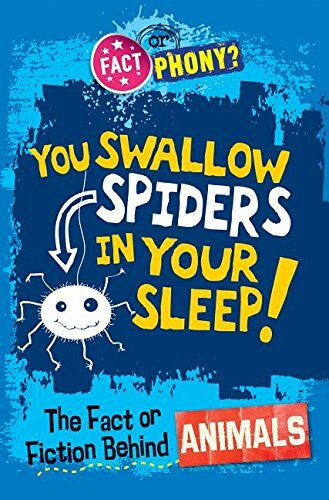 You Swallow Spiders in your Sleep! Amazon.com description: Product Description: The world is full of amazing animals, but some facts about them often seem too strange to be true. Do goldfish really have short memories? Is cow flatulence really ruining the ozone layer? This book takes a magnifying glass to some of the wildest things people say about animals to find the truth behind the exaggerations, misunderstandings, or even lies we accidentally spread as fact. Fact boxes throughout the book help readers separate the facts from fiction, and entertaining cartoons and illustrations add to the animal fun. from Gareth Stevens Pub (January 15, 2016); titled "You Swallow Spiders in your Sleep!" About: The world is full of amazing animals, but some facts about them often seem too strange to be true.